Before reading on, carve 30 seconds out of your busy schedule and watch this year&apos;s US Open of Surfing teaser below. We promise it will get you stoked. The Huntington Beach Pier will soon make a few new friends—actually, make that a few hundred thousand new friends. 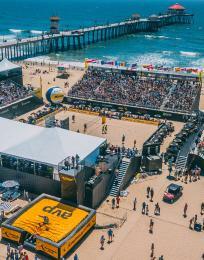 The 2017 Vans US Open of Surfing has already claimed the south side of the pier, marking the fifth straight year of the Orange County-based skate company manning the world&apos;s largest action sports festival. It formally kicks off on Saturday, July 29, and rips through Sunday, August 6. With a continued focus on its core, the nine-day family-friendly, community-centric competition welcomes the world&apos;s biggest names in surfing, skate, and BMX. More than 300 world-class athletes and over half a million spectators are expected to attend. Alongside the action, Van Doren Village will again play host to art exhibitions and hands-on creative workshops, Steve Van Doren will resume his usual post behind the community grill, and Vans Movie Nights return to Pier Amphitheater. Here&apos;s a rundown of this year&apos;s happenings. Schedule: View the complete schedule of events at www.vansusopenofsurfing.com/2017/schedule. Please note that the full surf schedule will be posted the week of the competition. 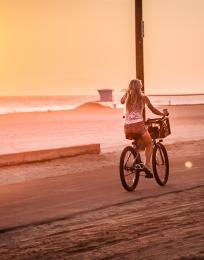 Viewing: Huntington Beach Pier, Surf Stadium, and on the sand. 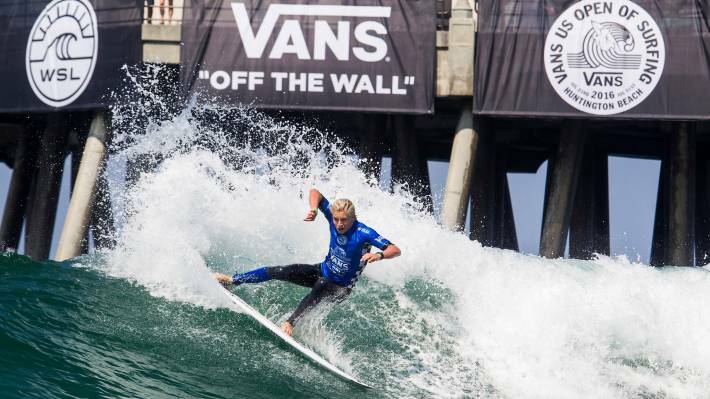 All events can also be viewed live via www.vansusopenofsurfing.com, www.worldsurfleague.com, the WSL app, and WSL Facebook LIVE. Check local listings for coverage on CBS Sports Network. Forecast: View the complete surfline forecast at www.vansusopenofsurfing.com/2017-surf/surfline-forecast. Transportation: Hop on the free Surf City USA Shuttle, which, in addition to its regular two loops, will offer a special park-and-ride service on both event weekends (July 29 - 30 and Aug. 5 - 6) from 10 a.m. - 10 p.m. Service runs to Main Street and Orange Avenue in Downtown from two locations: Huntington Beach High School (1905 Main Street, enter off Utica Avenue) and Edison High School (21400 Magnolia Street). Shuttles run every half hour; the last one leaves Downtown at 9:30 p.m. Additional service on Aug. 5 - 6 weekend runs from the Huntington Beach Civic Center (2000 Main Street) from 10 a.m. - 7 p.m. Shuttles run every half hour; the last one leaves Downtown at 6:30 p.m. Regular weekend service will also be running via the Coastal Loop, serving five stops along the coast, and City Loop, serving 13 stops throughout Huntington Beach. Track all shuttles via live GPS at www.surfcityusashuttle.com. 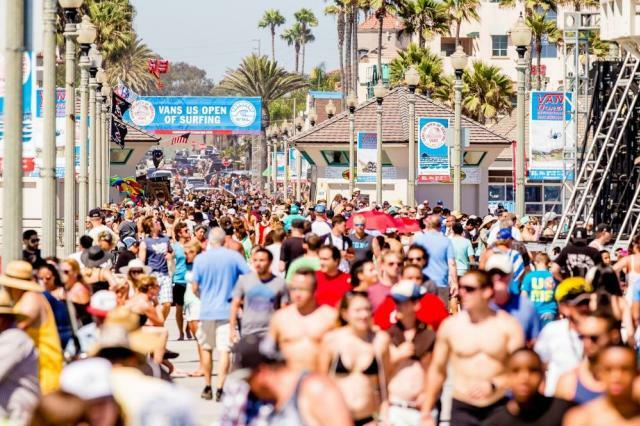 The Positive Vibe Warriors Foundation and the Gudauskas Brothers will host the 6th Annual Stoke-O-Rama surf celebration on Saturday, July 29, at 9th Street. This free kids-only surf event raises awareness and funds for local youth water safety and ocean education programs. Details are available at www.vansusopenofsurfing.com/2017-surf/news-article/surf-city-hosts-annual-stoke-o-rama-surf-celebration-on-july-29. Vans Movie Nights invite families to watch their favorite flicks by the beach at the Pier Amphitheater—complete with free popcorn and gelato! Watch “Moana” on Sunday, July 30, and “E.T.” on Monday, July 31. Movies start at 7 p.m. In keeping with tradition, Steve Van Doren will be grilling up free hot dogs from noon - 2 p.m. daily in the Van Doren Village. New House of Vans workshops in the Van Doren Village include: customizing your own fanny pack, learning to screenprint, and creating your own surf wax with a Vans surf team rider. View the complete schedule at www.vansusopenofsurfing.com/2017/schedule. The Vans BMX team will showcase a flatland demo every day from 1-2 p.m. in the Van Doren Village. The Vans Snow team will host a team signing and free snow cones on Friday, August 4, at 2:30 p.m. in the Van Doren Village. 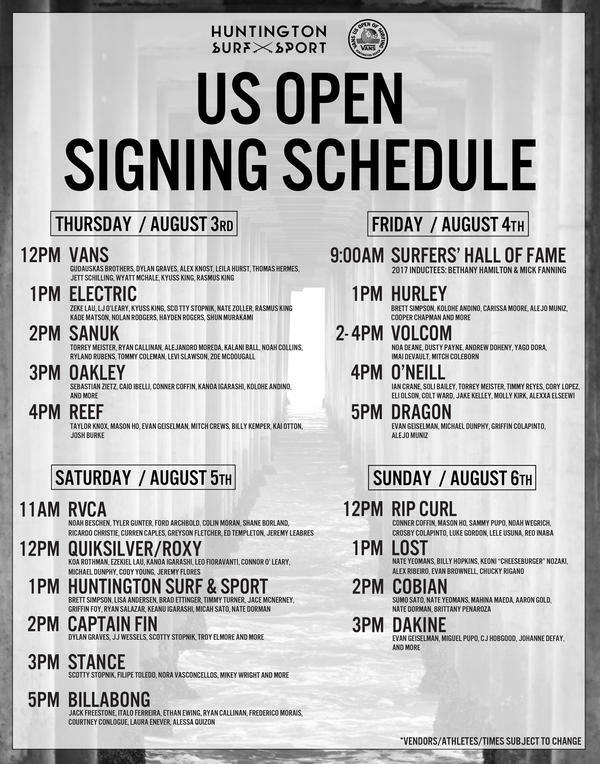 Huntington Surf & Sport has lined up athlete signings in front of its post at Main Street and Pacific Coast Highway from Sunday, July 30, through Sunday, August 6. See the full schedule below (subject to change). The 2017 Surfing Walk of Fame induction ceremony is slated for Thursday, August 3, at 9 a.m., in front of Jack’s Surfboards (101 Main Street). Free and open to the public, the induction ceremony is followed by a luncheon, tickets for which cost $40 and can be purchased by calling 714-536-6567. The 2017 Surfer&apos;s Hall of Fame induction ceremony follows on Friday August 4, at 9 a.m. in front of Huntington Surf & Sport (300 Pacific Coast Highway). Free and open to the public, this year’s induction ceremony honors Bethany Hamilton and Mick Fanning. Schedule: View the complete schedule of events at www.vansusopenofsurfing.com/2017-surf/schedule—all of which take place at Surf Stadium. Who&apos;s surfing? See the full lineup at www.vansusopenofsurfing.com/2017-surf/competitors. Fun Facts: This year’s surfing lineup includes the sixth stop on the Women’s World Surf League (WSL) Championship Tour (CT), in addition to the Men’s Qualifying Series (QS) 10,000 event and a combined WSL Pro Junior event. In the WSL Women’s CT event, the elite field will see the Top 17 battle for the win, including Santa Ana local Courtney Conlogue (USA), defending event winner Tatiana Weston-Webb (HAW), reigning WSL Champion and current World No. 1 Tyler Wright (AUS), and six-time WSL Champion Stephanie Gilmore (AUS). What&apos;s on the line? Men&apos;s and women&apos;s first place prize purses totaling $622,500. Homegrown // Shout-out to our local shredders: Courtney Conlogue, #4; Lakey Peterson, #7; Brett Simpson, #62; and Kanoa Igarashi, #65. Women&apos;s Final // Sun, 8/6, TBD. Men&apos;s Final // Sun, 8/6, TBD. Awards // Sun, 8/6, TBD. Schedule // View the complete schedule of events at www.vansusopenofsurfing.com/2017-skate/schedule—all of which take place at the Vans Pro Park. Who&apos;s skating? 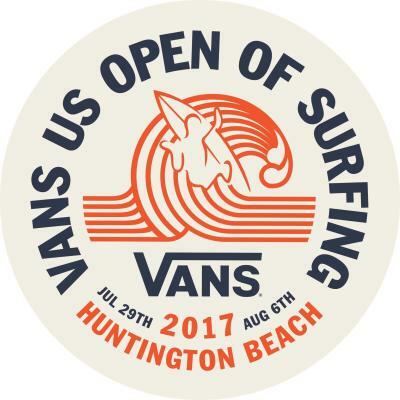 See the full lineup at www.vansusopenofsurfing.com/2017-skate/skaters. Fun Facts: The custom concrete Vans Pro Park on the sand will feature current world champions Alex Sorgente and Brighton Zeuner facing off against top contenders like Pedro Barros and Curren Caples. The week sees the final Vans Park Series (VPS) World Championship Pro Tour global qualifying stops, as well as crowning of the first-ever VPS Americas Continental Champions of park terrain skateboarding, the open pathway to the 2017 VPS World Championships. 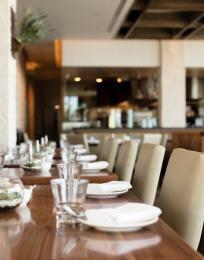 What&apos;s on the line? $125,000 first place prize purse. VPS Continental Championships Women&apos;s Final: Sun, 7/30, noon-1 p.m.
VPS Continental Championships Men&apos;s Final: Sun, 7/30, 6-7 p.m.
VPS Women&apos;s Final: Thurs, 8/3, 4-5 p.m.
VPS Global Final: Sat, 8/5, 4-5 p.m.
VPS Global Awards & Post Show: Sat, 8/5, 5-6 p.m. Schedule: View the complete schedule of events at http://www.vansusopenofsurfing.com/2017-bmx/schedule—which take place at the Amphitheater and Vans Pro Park. Who&apos;s riding? See the full lineup at www.vansusopenofsurfing.com/2017-bmx/riders. Fun Facts: Gary Young, Chase Hawk, Sergio Layos, and more will battle it out to determine a new world champion in the culminating event of the inaugural Vans BMX Pro Cup Men’s World Championship Series. What&apos;s on the line? $53,000 first place prize purse. 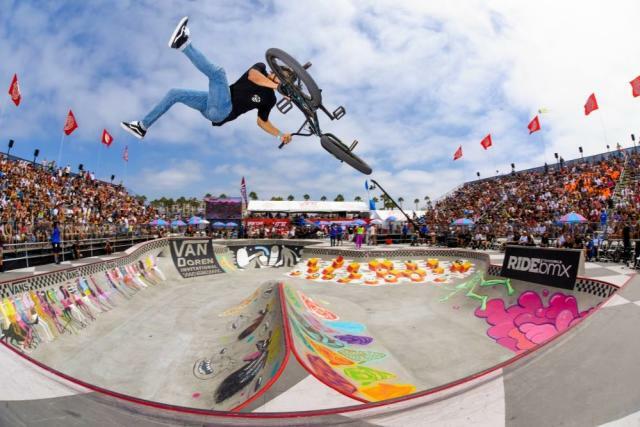 Vans BMX Pro Cup Women’s Final: Sun, 8/6, noon-1:30 p.m.
Vans BMX Pro Cup Men’s Final: Sun, 8/6, 3-5 p.m.
Vans BMX Pro Cup Awards: Sun, 8/6, 5-5:15 p.m.
A Huntington Beach local since 2013, Lauren specializes in writing and editing, holds an affinity for journals, and has a heart for philanthropy, handmade, and a good story. You can usually find her at Huntington Dog Beach, on a yoga mat, behind a pint of beer, or on the hunt for the next great treat. Say hello if you see her. 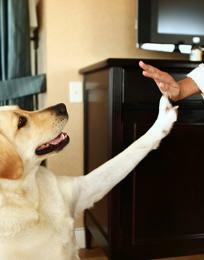 She loves to talk to strangers.